Just like in the history books. It's official, The Oregon Trail: American Settler has officially gone mainstream. 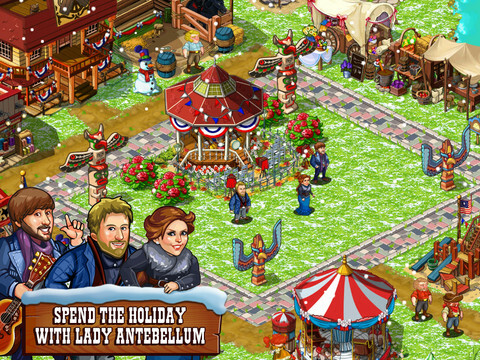 Gameloft's latest update brings seven-time Grammy Award-winning group, Lady Antebellum, to the frontier, along with holiday goodies. Users will be able to interact with the country music sensation once they reach level 15, watching them perform at the Concert Hall. In addition, they'll share frontier postcards with friends via town photo sharing, enjoy a snow-covered America and holiday-themed quests, outfits and decorations. Granted, Lady Antebellum fans stand to get the most from this content, but taking into account the whole package, there should be something for everyone.